Leila Raines poses with her trophy after winning the Ohio Junior Girls Championship Tuesday at Marion Country Club. How many times have you heard that one before? Well, let Leila Raines’ early-week success serve as yet another reminder. 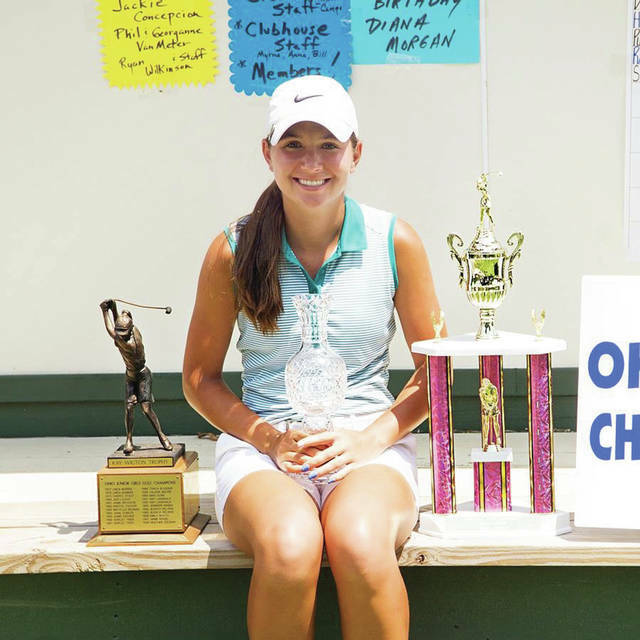 The Olentangy Berlin junior-to-be carded a final-round 68 and edged Upper Arlington’s Emily Hummer in a two-hole playoff to win the 42nd annual Ohio Junior Girls Championship Monday and Tuesday at Marion Country Club. Talk about finishing strong … and that was after firing a six-over-par 78 in the first round — a mark eight shots in back of Hummer’s opening-round effort. Staying away from the big numbers, she said, was just as important as stringing together a handful of small ones over the course of the two-day event. Hummer shot a four-over-par 76 in Tuesday’s final round while Raines collected five birdies and an eagle on the par-five 11th on the way to her four-under 68. The two were tied at 146 after 36 holes, two strokes better than Hudson’s Jenn David and three shots ahead of St. Marys’ Jill Schmitmeyer. Hummer three-putted the last hole to leave the door open for Raines, who calmly sank a putt from more than 10 feet away to keep things tied after the 408-yard par-five first. It was then, on the 145-yard par-three second, Raines finally took control. She hit the green in regulation while Hummer’s approach sailed behind it. That was the difference. Leila’s sister, Mia, was also in action. She finished second in the 13-and-under age group with a 166.